The captain and his deputy have a lot to look forward to in the series. India tour of Australia is all set to kickstart with the T20 internationals tomorrow. With skipper Virat Kohli back in the frame, Rohit Sharma will be back to honouring the vice-captain duties. 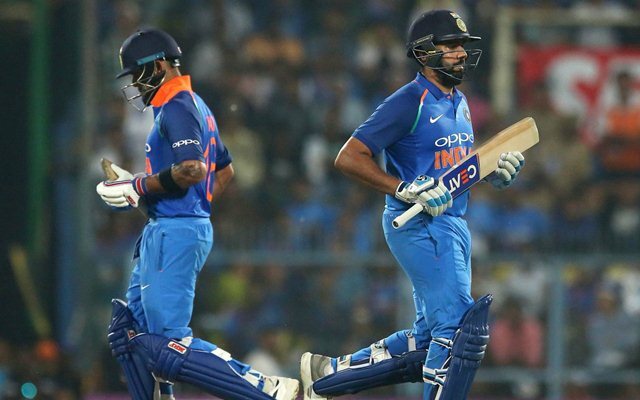 Both have been regarded as top batsmen in the limited-overs format and their performances have been key to India’s success over the last few years. Rohit recently attained the record of scoring the most centuries in T20 Internationals. When he steps out to the crease at the Gabba tomorrow, the 31-year-old will be eyeing another record. Rohit currently stands second in the list of top run scorers in the T20 international cricket. He will be aiming to pip New Zealander Martin Guptill from the top spot. Rohit is also four sixes away from completing 100 sixes in the shortest format. The difference between him and the top spot is 64 runs and it is quite likely that Rohit will get ahead in the runs tally during the course of the three-match series. Guptill has 2271 runs to his name and he’s followed by Rohit at 2207 runs. However, India’s maverick skipper Virat Kohli isn’t far as well in the run-getters list. Standing at the fifth position with 2102 runs, Kohli is also in the race to lead the table. If he manages to get a big score in the series, the 30-year-old will also come into the reckoning. He already has the best average in T20Is by anyone with more than 1000 runs. Hence, both Rohit and Kohli will be all geared up. Also, with the absence of MS Dhoni, they will also be donning the senior role in making decisions for the team. Team India is currently ranked No.2 in the format while Australia is at No 3 and it is expected to be a closely fought series. Get the latest Cricket News and updates from Australia vs India series, Match Predictions, Fantasy Cricket Tips and lots more on CricTracker.com.